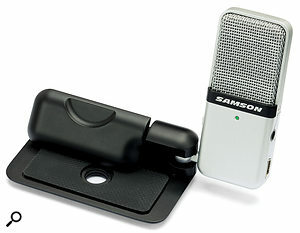 USB mics are nothing new, but the Samson Go Mic is probably the smallest and cutest I've seen to date. This metal-bodied mic, which measures just 70.5 x 43.5 x 23mm, employs a pair of back-to-back, cardioid, 10mm, back-electret capsules, so it can be switched between cardioid and omni patterns. Also novel is the combined mount and mic storage clip, which incorporates a swivel joint to let you set the mic at the required angle. When not in use, the mic folds back into the clip, and the whole thing goes into a zip-up storage pouch that's no larger than the kind that would fit a pair of earbuds. Usefully, the mount has a standard European mic thread, so that it can be screwed onto a mic stand if necessary. Connection is via a miniature USB cable, and for monitoring there's a 3.5mm stereo mini-jack headphone output on the side of the mic. A three-position slide switch selects between the cardioid and omni patterns, and when in the centre position it gives a cardioid pattern with a 10dB pad. There's no level control on the headphone outlet, but this can usually be set in the recording software. Similarly, there's no way to control the output level from the mic, other than via the pad switch — but it seems ideally matched to the level of voices and acoustic guitars. Bring in the pad and it could also be used for smaller guitar amps, and possibly even drum overheads. The mic is a USB class-compliant device, so it needs no drivers. Once selected from within my DAW software (in this case Logic 8), the mic became the source and appeared as a stereo input, with both channels carrying the same signal. For mono tracks, selecting either of the two inputs provides the necessary mono signal. Monitoring is in stereo and is simply the DAW output, so there's no direct 'zero latency' monitoring option. The headphone output on the mic gave subjectively the same sound quality as my Mac's own headphone output.